Raising Jedi | NO SPOILERS! Padawan Colin and The Force Awakens! For months nearly every person asks my son the same thing. “Are you excited about the new Star Wars movie?” That is like asking Han if the Millennium Falcon can make the Kessel Run in less than twelve parsecs. Excited is an understatement. This kid has been growing a padawan braid for the last year! From the lines at the theater, it appears that he is in good company. 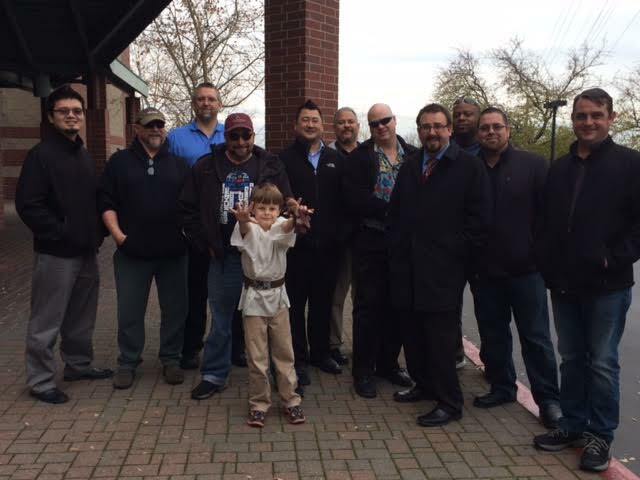 Since Colin’s love of Star Wars has traveled around quite a bit, we were invited by the Information Technology department of his dad’s work to join in their viewing of “The Force Awakens.” That’s right, we were hanging with the IT crowd. Try to outgeek that! However, since you asked, on the way home I gave him a little interview…. He went on, but I promised you no spoilers, so this is the best I can do. Assuming an eight year old isn’t going to blab about Star Wars is about as realistic as the part when the REDACTED flew into the REDACTED. Let’s see if I can do this from a parent’s point of view. I can’t tell you if this movie is right for your spectrum kiddo, because every kiddo is so very different, but this is what I got out of it…. When the opening score started, My son grabbed my hand, then his dad’s, and thrust them into the air in triumph. I have to see it again, because during the best scenes, I was not watching the movie. I was watching my son. His tiny little jaw was on the floor. If you want movie magic, it doesn’t get any better than that. I could say more, but let’s be real… you are going to see it. For a bit of added fun, here is the Padawan just before entering the theater. He is a little excited. And, like I said… the braid is real. Tagged autism, fan, Jedi kid, No spoilers, review, special needs, Star Wars, The Force Awakens. Bookmark the permalink.